We stop quilting in late May. The school house is part of the Historic Village so many tourists and locals stop by in the summer to wander through the museum and look at the old buildings. Most summers involve at least one renovation project. 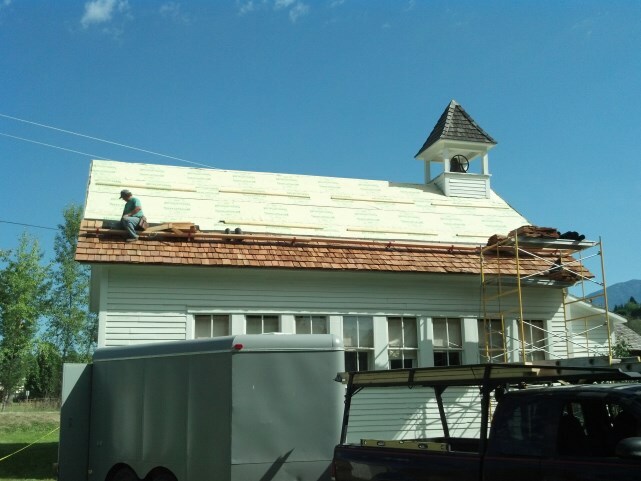 This year it is re-roofing and painting the old school house, the building where we quilt in the winter. Rick and Melinda are doing the roof job. During this hot weather that we are currently having, they usually start about 6:00am. I stop over in the morning on my walk to see their progress. What’s not to like about the school house getting a lovely new roof? A sturdy roof and the new paint will help preserve the building longer. But the expense of keeping all the buildings in the village in good shape is a challenge. When I watch Rick put the shakes on, I think of the quilting that would be required to cover the expenses. The county helped with a donation but we still have a ways to go towards covering the cost. Cathy is planning an amazing dinner at Dickey Lake on August 10th as a fundraiser. As with many of these projects though in a small town (the arts, animal shelter, scouts, social support) we nickel and dime our way. I hear about the salaries of fancy CEOs and sport stars and wonder why it is so difficult for us to come up with a few thousand when these people make millions upon millions. I am still waiting for a book on economics to show up in interlibrary loan that might explain this disparity.